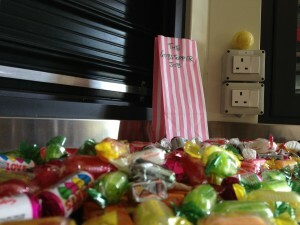 The Gobstopper Job. Because everyone’s wanted to run a heist at some point in their lives. 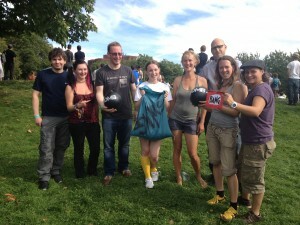 We ran the Job in Bristol at the Interesting Games Festival, in Castle Park. We were part of the fringe – a raft of oddball, interesting, quirky games that worked in public and that could be played fairly casually, in a pick-up-and-play sort of way. I didn’t get the chance to play any of the others, due to being on duty in a large plastic police hat with a flashing blue light on top for most of the afternoon, but I saw a balancing game with hand turtles, a slow-motion combat game, a coloured-water-shooting game called Rainbow Rain, and a game about phone hacking that had people in trilbies running around the park looking for mobile phones. It was all rather bonkers and lovely. Gobstopper worked in part because of the space we played in – bonkers and lovely – and because of the costumes and props Grant put together. I mean, it worked because of a load of other things too, but Grant (who was the main designer on this one) has already written an interesting post about froth and emergent stuff and verbs and what have you, which is well worth reading and has more pictures. This, by contrast, is a bit of an epic. 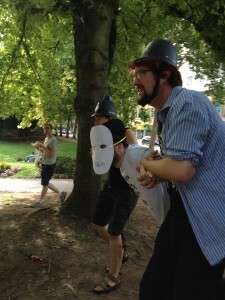 Despite appearances to the contrary – such as the name Zombie LARP – I don’t really think of what we do as LARP any more. It differs in some pretty major respects from what I’d instinctively label “traditional” LARP – though I’m certain that’s the wrong label – it’s fundamentally neither plot nor character driven, but situation-led and responsive to player/character action. Its worlds are small, not entirely internally consistent, and exist only for short periods before they are dissolved; their parameters are fluid and they are never fully realised. The lines between player and character are deliberately blurred. But neither does the term “live game” or “pervasive game” (whatever that is) suit us. Most live games I see on the scene at present offer limited or no opportunity for player characterisation beyond the opportunity to nebulously pretend. They are mostly unaffected by character action beyond the mechanical, and function within the real world – without a need for suspension of disbelief. In Gobstopper, as in Zombie, I saw the emergence of distinct play styles. Some people come to Zombie to LARP – they bring characters, immerse themselves in a story of their own making, and use our world and mechanics as a way to play that story out. This is improv theatre with rules. Others come to live game – they are uninterested in roleplay, preferring to focus on the mechanics of the game rather than the story, and lose themselves in the adrenaline of the moment. Some come to do both. The Gobstopper Job, like Zombie and like a few other games – 2.8 Hours Later and Incitement spring to mind, in different ways – operates on the lines between those two categories. There are no good terms for what we do, and it’s difficult to suggest any that don’t imply that other games that fit the genre boxes more neatly are somehow deficient. Story-driven live game might be one option; emergent short-term LARP might be another. Both are clumsy. At present, we lack the right terms. Gobstopper was the first time we’ve really run a game outside a dedicated game space. We had a kiosk – the sort you get in parks, that might sell water or ice cream or sweets – at one end, and a base station at the other. 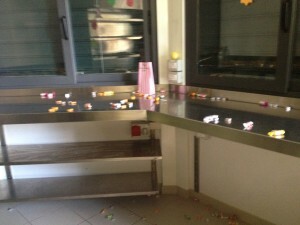 Players dressed as robbers (well, with masks and maybe hats) had to get the swag bag into the kiosk, steal as many sweets as possible in 30 seconds, then get them back to base, all the while avoiding the police – four or five people patrolling outside, who could arrest them if they could catch them. The players for each run had to pick a character class – a single thing they could do – and with it came a prop with which they could do it. Gunmen had a little bang-flag gun that let them incapacitate one policeman. Demo men had a bouncing cherry bomb with the word BOMB on it that could stun people in a radius. Conmen had big ridiculous white masks that disguised them as “Young Gavin”, the rookie, or “Old Bob”, who was only a few days from retirement. 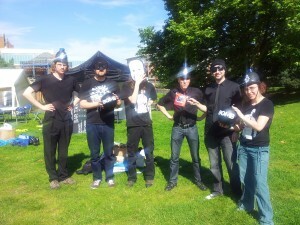 And Bag men had the swag bag, and had to get them into the kiosk – essentially a very low-tech hacker analogue. Chekhov’s gun – the concept that if there is a gun on the mantelpiece in the first act of a play, it must be fired by the end – is a metaphor for foreshadowing, simplicity and dramatic necessity. It’s also a useful way to think about Gobstopper, and why it works. Each player gets a verb – a single mode of interaction with the game and with the world it creates – and extremely limited opportunities to use it. Every player gets to be their own dramatist, timing their climactic moment in their own personal trajectory through the game. This only works if players believe in the power of their gun to affect the world, and understand its importance. Oh, and remember to use it. Occasionally people forgot, in the excitement of the whole thing. A fundamental design problem for us is the necessity of blurring the boundaries for players between the states of being, doing, performing and playing. What we’re after is almost the opposite of Brecht’s Verfremdungseffekt. Rather than using realistic props and costume to draw attention to the unreality of the performance, we’re using unrealistic, very stylised costume and props to create a sort of shorthand of familiarity. We are reliant on caricature and stereotype as tools to build identification between the players and the world we need them to inhabit – not a perfectly realistic, immersive environment in which they can lose themselves, but a working reality with fuzzy boundaries but basic concepts and rules to hold on to. So, giving players a tool they can use matters, but giving them a tool they can instantly understand and relate to is even better. Using sweets to tap into the part of an adult that’s still six years old; using BANG-flag guns and BOMB-painted bombs; letting the only people who need to improvise a conversation hide their faces beneath enormous saucer-masks that both make it easier to act and also render it unnecessary – these are all tactics that tap into familiar childhood games, helping to minimse embarrassment and flow-jarring moments. That’s before we get into the psychology of costume itself, and the impact it has on roles – here, we wanted playfulness and fun, a cops’n’robbers feel, whereas when we want to make something more serious we’ll make it look and feel more lifelike and realistic. One convenient side-effect of this approach is that it gives the audience a simple way to relate to the game. With crew in giant police hats and players in robber masks, there is an obvious metaphor for viewers to grasp and to buy into. We found both sides got cheers from passers-by, depending on who seemed like the underdog at any given moment. As policemen, we spent a fair amount of time talking to random people who saw us wearing daft hats and wanted to know what on earth was going on. We fielded a couple of people who were oddly thrilled that someone was using the kiosk for something, and directed a few folks to the sign-up desk. Policeman hats and a slow walk seem to create an aura of helpfulness around you – and serve as useful ads for the game, too. The other big thing they did was help the players feel less weird about getting dressed up. They were absolutely guaranteed that the people running the game would look even dafter than they did. Obvious signalling and the familiarisation effect combined together, along with a healthy dose of physical and mental activity, got players focussed on the game and served to make it easier for them to enter that peculiar place where being, doing, performing and playing all merge together and stories seem to naturally emerge, without anyone deliberately designing them, from the seemingly natural actions of all the participants. The moment where I knew it had worked was when one run ended and it took five minutes of listening to the players talk through exactly what had happened when and how before I could get a word in edgeways. We’re going to be running The Gobstopper Job again, given how well it seems to have worked – and given the fact that we still have about 15kg of sweets in our front room. London somewhere, probably. We’ll be putting out info on the Facebook page as soon as we’ve made up our minds when and where. Do come.